Not surprisingly, this fall's love fest with the shiny stuff—glitter, sequins, metallics—has reached a feverish pitch during the holiday season. Glittery garments have been making the scene at night as well as during the day (gasp!). On a recent afternoon, I saw a young woman strolling the beach in a solid sliver sequin top. It was a bit blinding, needless to say. Personally, I prefer the twinkle of glitter and sequins by candlelight or moonlight--at night, that is. A sparkly garment, like the Sequin Skirt (Brown, Size SM) (was $129, now $59) above, can rescue me from the winter doldrums, energizing me for a night on the town. 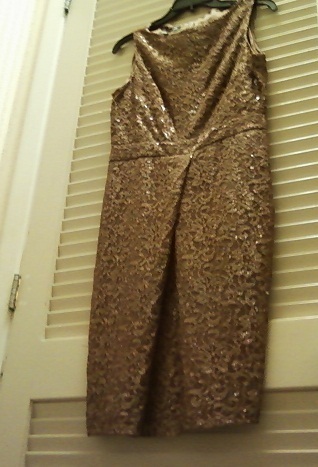 (I'm ga-ga for those chocolate brown sequins!) So for this week's Favorites Over Fifty (FOF), I've assembled my favorite looks in glitter, sequins and metallics for over 50 women. Whether you’re thinking about adding a little twinkle to your New Year’s Eve look or for an upcoming 'black tie optional' wedding or to just wipe away the winter doldrums, click "Read More" below to see my favorite glittery options. I've included current marked downs where applicable and the text hyperlinks, so you can learn more about the garments or shop. 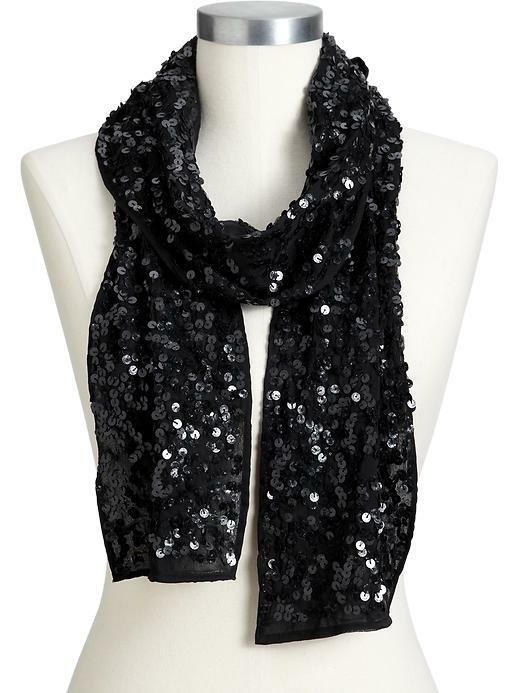 I love dark sequins because they catch the light and twinkle, but are never blinding. For a look with a little extra pop, add a glittery silver accessory, like a bangle or clutch. Click on AnneKlein.com and take a peak at the Foiled Boat Neck Tunic (was $119, now $89) under "Tops." It looks very comfortable. Looking for something in a Plus Size? Take a peek at this comfortable, well-priced Women's Plus Size Plush Sequin Elastic Waist Skirt - Navy, 18W (was $89.99, now $39.99) in navy blue from Land's End. It's available in Petite and Regular Sizes as well. A shiny separate (a glitter top or skirt) paired with a solid top or bottom adds twinkle without going high beam. I want to look festive, not manic. 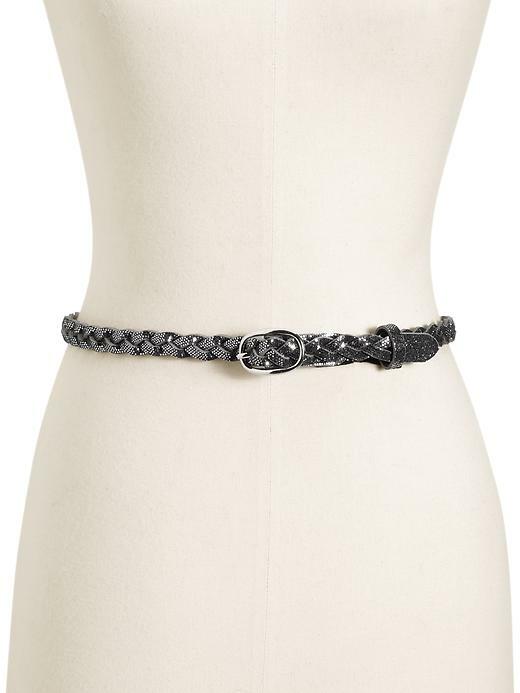 I love the pairing of the Jones New York Sequin Pull On Skirt (Black, Size L) ($149) with the dark grey T-shirt and black belt and jacket in the photo above. 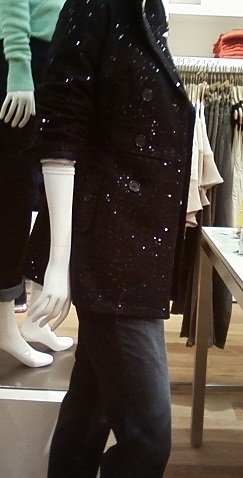 Or for something with a little edge, how about the Sequin Boiled Wool Blend Pea Coat (was $198, but it's 50% off now) below with jeans. 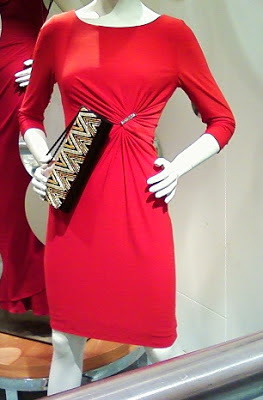 What a perfect look for a New Year's Eve concert, don't you think? Jones New York ~ Jones New York Sequin Jacket (Black, Size 14) ($268) in Sizes 4-16. ~ Jones New York Sequin Front Cardigan (Grey, Size L) (was $129, now $59) in Sizes Small thru X-Large. Shopbop ~ Diane von Furstenberg Catalina Couture Sequin Tee (was $385, now $154) in Size 10 only. ~ Rachel Zoe Holly Sequin Dolman Top ($295) in Sizes 0-10. Unfortunately, gold is not a flattering color for my complexion. However, I love it on other over 50 women. Gold offers a warm sparkle and it's a great change from black, the go-to color for elegance. Need over 50 inspiration? Take a peek at Anna Wintour in a gorgeous gold dress. ~ Jones New York Silk Jacquard Blouse (Orange, Size 14) ($139) in Sizes 4-16. 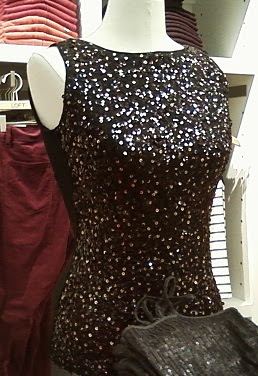 ~ This Jones New York Shiny Sleeveless Shell (Brown, Size 14) (was $79, now $39) is glitter-free, but has plenty of shine. Anne Klein ~ Anne Klein Sequin Collared Henley (Metallic, Size L) ($149) in Sizes Small - Large. I'm a New Yorker and I can tell you with confidence that the vast majority of my fellow New York revelers will be dressed in black on New Year's Eve. It's a tradition, it seems. That said, I love the idea of breaking out of black in a colorful garment with a hint of sparkle, like this Anne Klein Rhinestone Brooch Dress (Red, Size 14) ($128).